I’m always looking for better ways to store my crafting bits ‘n’ bobs. As my sewing needles and pins were scattered around in various places I wanted somewhere central to keep them and thought this would make a quick and simple project. 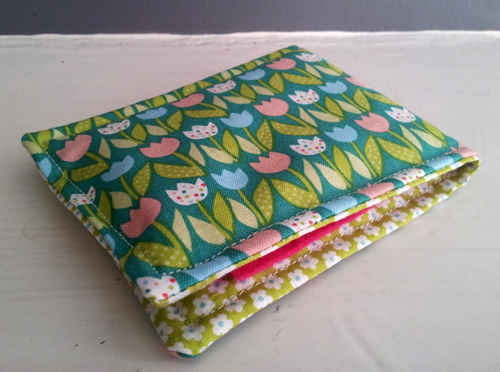 The fabric is from the House to Home collection by Benartex and was bought from ‘Beloved Fabrics’ on ebay. I haven’t done any applique for a long while and wanted to try adding some to the front, but needed to keep it simple as the fabric itself is quite busy. 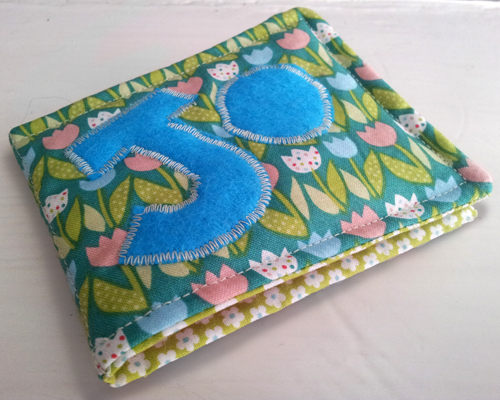 I opted for felt as it is easy to work with and doesn’t fray. 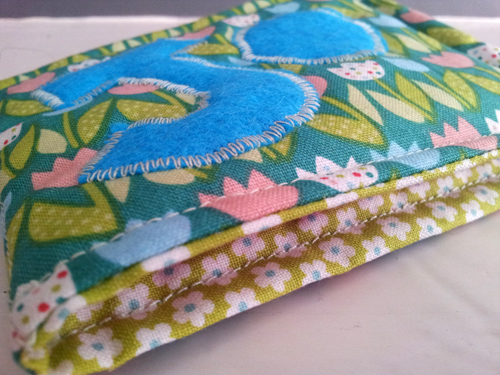 I added a layer of fleece in between the layers of fabric to give the needle case some structure. 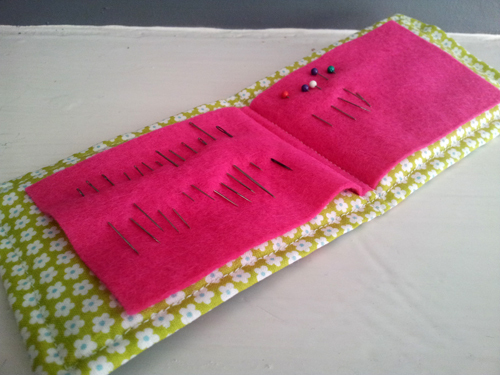 The finishing touch was to add a brightly coloured piece of felt inside to hold the needles. 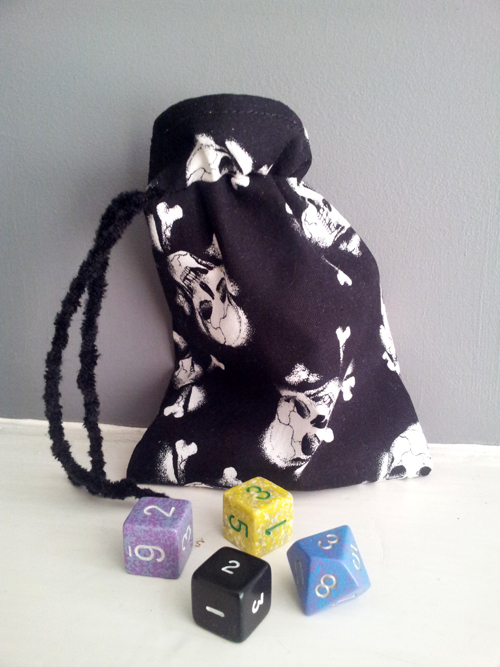 This is a simple draw-string bag I made for my husband to keep his dice in (and to hide them from the cats who love kicking them around!). I bought some skull and crossbones material from ‘Oh Sew Crafty’ on ebay and created a twisted cord from wool. I’ve been looking for ways to turn unwanted items into something useful. 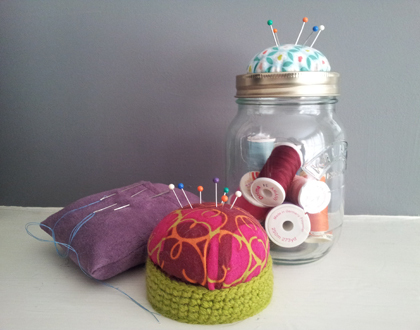 On this occasion, an old pickling jar, screw-top lid and jewellery packaging have been transformed into much-needed pin cushions.